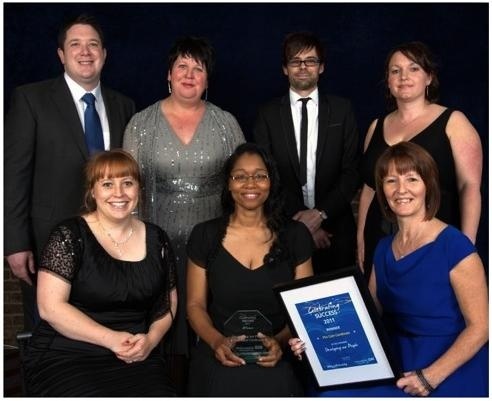 The 'Celebrating Success' awards are an annual event run by the Royal Derby Hospital to highlight outstanding work carried out by departments within the Trust through out the year. 103 departments entered the competition and were short listed into 3 teams per category. The Mortuary team was short listed and entered into the 'Developing Our People' category, based on the continuing efforts in educating members of staff and interested parties about the work that is carried out by the mortuary, the role of the staff and the teams' relationship with other departments within the hospital. On-going training was provided to all nursing and portering staff regarding last offices, dignity issues, care after death and Mortuary procedures. Related departments were given tours of the facility with the aim of improving understanding of this field of medicine and its function within the Health Service. Medical students were given post mortem examination tutorials by APT's and Pathologists in order that they are more informed when requesting consented post mortems from relatives. Information was provided regarding the coronial process to educate them as to which cases to refer to the Coroner. A comprehensive application detailing the work that the team carried over the year was submitted to the celebrating success team entitled 'The Care Continues', a poster was then produced summarizing our efforts. Voting was then opened to the hospital staff and general public. Voting closed and the winners were announced on the evening of the 27th September during a ceremony at the Derby Assembly Rooms, The team received an award and a certificate from the Chief Executive, Sue James to display in the department.